This look is inspired by Stylist Magazine‘s Trend on Trial. First I applied Bobbi Brown Natural Finish Long Lasting Foundation SPF 15 in Golden on to my forehead, chin and jaw line using my No7 foundation brush. I then applied my Bobbi Brown Natural Finish Long Lasting Foundation SPF 15 in Warm Honey in the 5.5 to my cheeks and nose using the same brush. 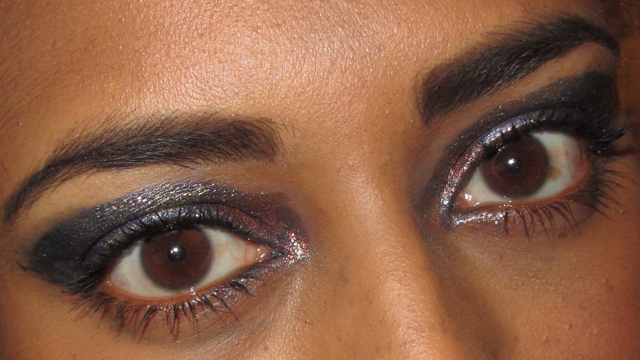 Using my fingers I applied KIKO Milano make up eye base all over my eyelids up to my brow bone. Using my Models Own shading brush I applied Maybelline Colour Tattoo 24 Hour cream gel eyeshadow in 25 Everlasting Navy all over my eyelids and above the crease in a winged shape. 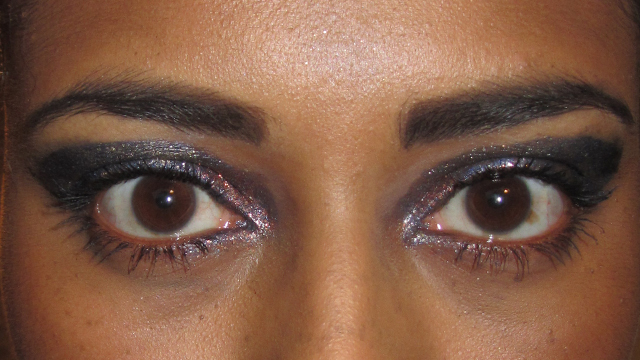 Using the sponge applicator in my MUA Luxe glitter eye palette in Burlesque, I applied the pale gold colour over nearly all of my eyelid in varying intensity, with the greatest intensity in the inner corner of my eye spreading out to cover nearly all of my eyelid including above the crease. 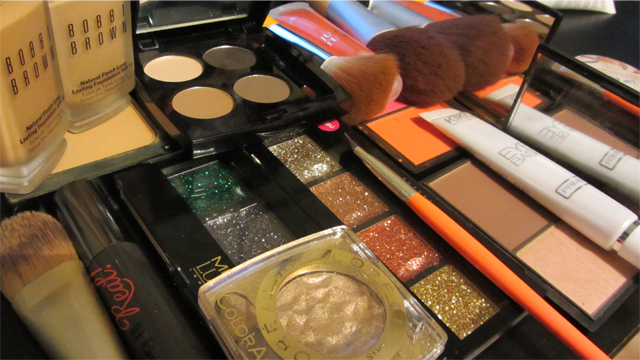 Using the sponge applicator I dabbed L’Oreal Paris Color Appeal in 151 pure gold over the glitter to intensify the colour. 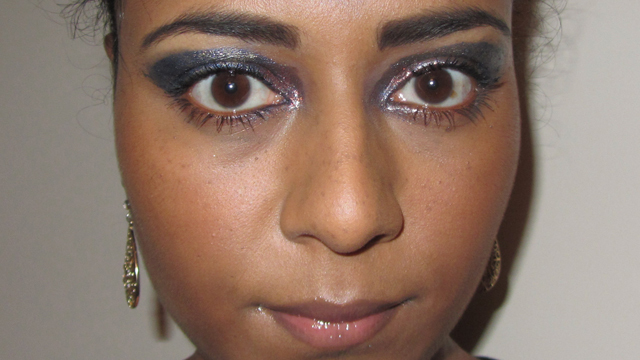 Then using the sponge applicator in my MUA Luxe glitter eye palette in Diva, I applied the grey-black colour to the outer edge of my eyelids to add sparkle to the blue eye shadow which did not have gold glitter on it. 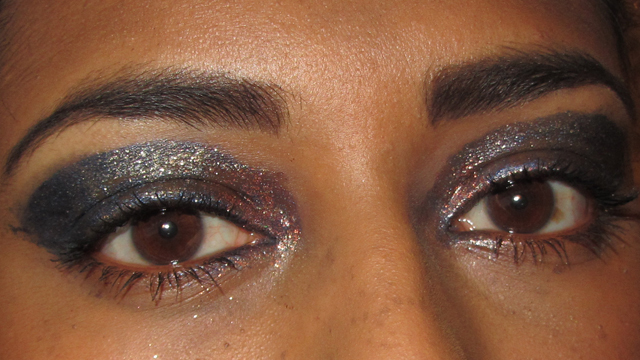 I then applied the orange glitter from the Burlesque palette to the inner corners of my eyes. I defined my eyebrows using the darkest colour in the HD Brows Foxy palette and the angled brush included with that palette. I finished my eyes by applying two coats of Benefit’s They’re Real mascara in black to both my top and bottom lashes. I applied Bobbi Brown Illuminating Finish Powder Compact Foundation in Golden 6 using my EcoTools powder brush. I applied the same foundation to my nose and under my eyes using the sponge. I contoured the hollows of my cheeks using the dark colour in my Sleek Face Contour Kit in Medium 885 and my Models Own angled blush brush. I applied the lighter colour in the palette to the apples of my cheeks using the same brush. Again using the same brush I applied a light sweep of the orange blusher in my Sleek Blush by 3 blusher palette in Pumpkin 363. This blusher is quite bright so I toned it down with the light colour in of the face contour kit. I then blended the three colours using my EcoTools powder brush. I applied Lancôme Juicy Tubes in Cerise 15 which is an orange lip gloss, to my lips to finish. The pictures are a little different because it seems like the Eye Tattoo doesn’t like being in the crease of my eye so the look fell apart during application! I couldn’t bring myself to start again as this took ages, plus the fact I was trying to dictate my process to my computer which was somewhat arduous. I really like this look, it’s actually really pretty, but next time I think I will use a matte eye shadow as the base, or not use a separate eye base.